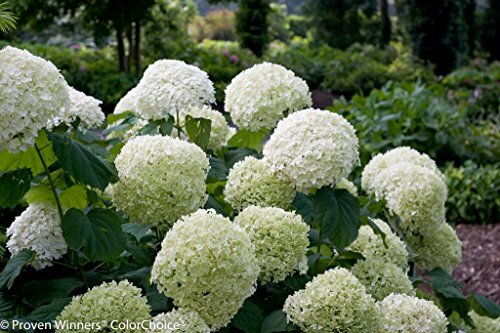 Incrediball hydrangea plants exhibit an upright growth habit and will reach a height of 4-5 feet tall, with a similar spread. This incredibly hardy variety boasts amazing blooms (up to 12" across) held on thick, sturdy stems that don’t flop. Flowers progress from lime green to white and back to green. They add heft to bouquets, fresh or dried. A Proven Winners®/Color Choice® variety. his incredibly hardy variety boasts amazing blooms (up to 12" across) held on thick, sturdy stems that don't flop. Flowers progress from lime green to white and back to green. They add heft to bouquets, fresh or dried. A Proven Winners®/Color Choice® variety.